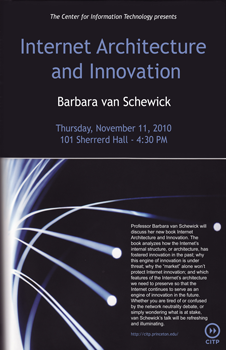 Barbara van Schewick will give a talk on her recently released and widely praised book, Internet Architecture and Innovation. Professor Marvin Ammori has described the book as “essential reading for anyone interested in Internet policy-and probably for anyone interested in the law, economics, technology, or start-ups.” The book analyzes how the Internet’s internal structure, or architecture, has fostered innovation in the past; why this engine of innovation is under threat; why the “market” alone won’t protect Internet innovation; and which features of the Internet’s architecture we need to preserve so that the Internet continues to serve as an engine of innovation in the future. Whether you are tired of or confused by the network neutrality debate, or simply wondering what is at stake, van Schewick’s talk will be refreshing and illuminating. More information on the book, including an overview and excerpts, is available at Internet Architecture and Innovation. 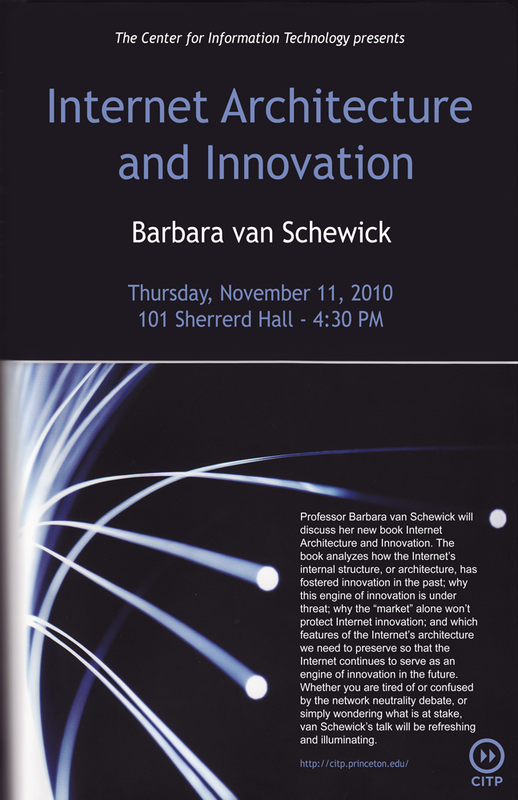 Barbara van Schewick is an Associate Professor of Law at Stanford Law School, an Associate Professor (by courtesy) of Electrical Engineering at Stanford’s Department of Electrical Engineering and the Director of Stanford Law School’s Center for Internet and Society. Van Schewick’s research focuses on the economic, regulatory, and strategic implications of communication networks. In particular, she explores how changes in the architecture of computer networks affect the economic environment for innovation and competition on the Internet, and how the law should react to these changes. This work has made her a leading expert on the issue of network neutrality. Her papers on network neutrality have influenced regulatory debates in the United States, Canada and Europe. 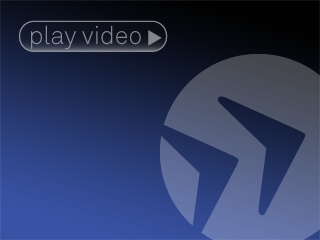 In 2007, van Schewick was one of three academics who, together with public interest groups, filed the petition that started the Federal Communications Commission’s network neutrality inquiry into Comcast’s blocking of BitTorrent and other peer-to-peer protocols. She has testified before the FCC in en banc hearings and official workshops.